Six girls between the ages of 14 and 10, and their moms of course, walking into the New Haven Coliseum with butterflies because they are about to see the Backstreet Boys perform. Crushes on Nick, Howie, and Brian consumed them as they climbed the stairs to their seats. 13 years later I can still remember hearing Alissa squeal when a little Aaron Carter came out on stage to jump on trampolines with his shoulder length blond hair as an opening act. This would begin Alissa’s crush on Aaron, which I fully supported because I saw that as less competition for Nick. We had started the night in the car talking about the newest boy band that had performed a concert on the Disney Channel the night before, NSYNC, and how we swooned for the blond one in the shiny blue pants, Mr. Justin Timberlake, but left with nothing but Backstreet Boys on our minds. The New Haven Coliseum is now a parking lot. Those six girls are all now twenty-somethings with individual lives. And the Backstreet Boys are a man down, but have formed the super boy band NKOTBSB. It’s every 90’s girl’s dream. 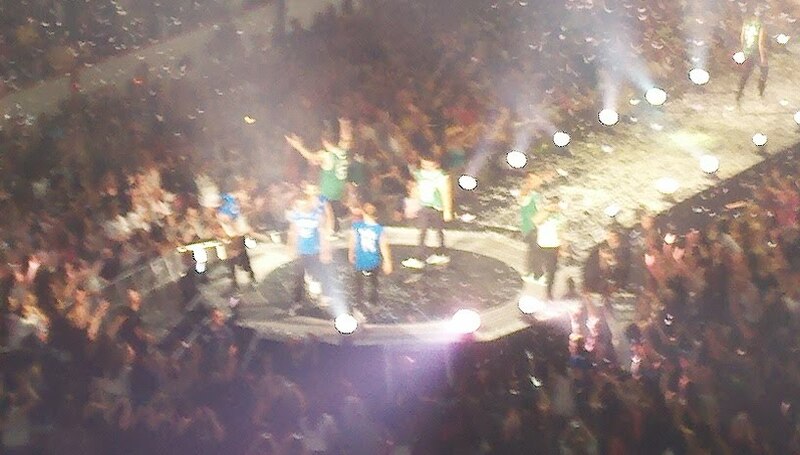 This night Nick, Brian, Howie, A.J., Donnie, Joey, Danny, Jordan, and Jonathon would perform at the Izod Center in New Jersey, and, thanks to Jaime, I would be there again.